Added on June 24, 2015 by Douglas Farrand. Monday June 15th 2015 was the Creative Musicianship Class for Middle School Students Final Showcase at ORNG Ink. It was a really wonderful event, with several members of the ORNG Ink and University of Orange communities attending, as well as one of our student’s father and sister. The whole event can be listened to below. After acknowledging the “graduating” students (track 1), the whole group - students, teachers, and audience members - did a short rendition of one of Oliveros’s “heart beat” exercises - moving from tapping to clapping our individual pulses, and then merging into one pulse (explanation - track 2, exercise - track 3). The students, Doug, and I then performed the group’s final composition “Ocean Tides” for drum, two trumpets, soprano saxophone, and clarinet (track 4). The final work took a jazz-esque “solo and head” form, with the first three entrances of the harmonic material being played by the whole group - first with the wind players in unison, then in harmony, and lastly in retrograde. There then followed three “solo and accompaniment” sections featuring soprano saxophone, clarinet, and then trumpet. The last “solo” began with Doug’s scraping his pocket trumpet against the floor which built into a noisy full-group improvisation for an exciting conclusion. Everyone who attended was excited and impressed by what was shared (track 5). While I can’t speak for the kids’ experience, I felt personally very blessed to have worked with them these past 8 weeks. Thank you all so much for your support in making this class happen. I look forward to more projects like this to come! Mindy Fullilove, University of Orange Board President, research psychiatrist, professor, and author, wrote about the Creative Musicianship Showcase on her blog, "Countdown to Main Street". Added on June 10, 2015 by Douglas Farrand. The past three weeks of class have been strange but enjoyable. On labor day, we held a class on FORM which consisted of three parts. In the first segment, Doug led the students through a listening activity in which they listened to a variety of short pieces of music and had to describe the form or construction/organization of each one. In this exercise they learned how any part of the musical material can be organized to create form - whether it be the harmony (as one student pointed out as we listened to Bach) or duration combined with timbre (as another student noted when we listened to a saxophone piece by Bhob Rainey) or something as simple as dynamic shape (for instance, the piece goes from soft to loud to soft). In the second segment Jessie let the students know that - even though all of these elements contribute to form - the day’s lesson was going to focus above all else on how form happens in time (the primary medium of music) and space (literal as well as imagined). 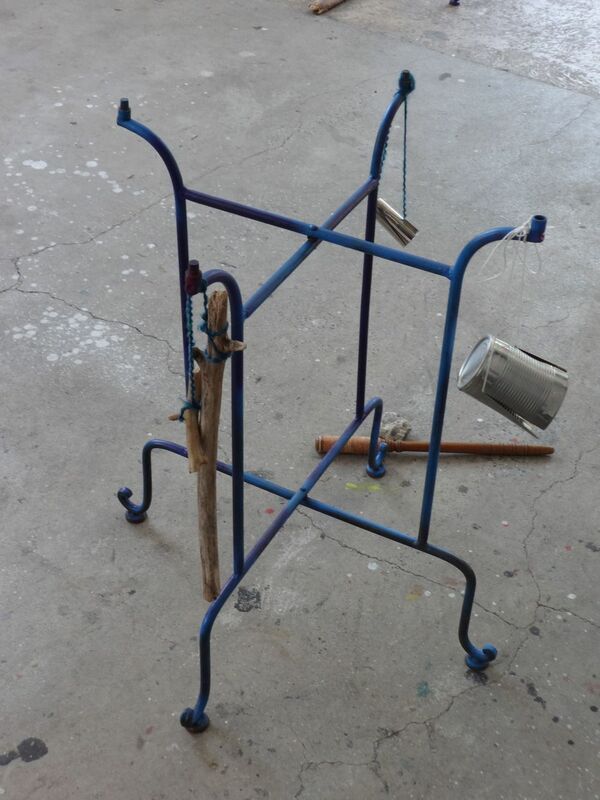 To this end, we had set up around the Gallery little “musical mobiles” (see above). First everyone simply observed how it was different to look at this arrangement then to look at a painting on a wall. The students noticed that with a painting you can take everything in at once and there is mostly one perspective, whereas walking through the mobiles (as in music) you take in bits and pieces rather than the whole, you see only individual or a small group of movements at a time even though you know these are part of something larger, and the objects and your perspective are constantly changing. We then moved to improvisations using this set-up, thinking about timing of motion from one station to another, one object to another, the relationships between things - much as a composer might do with sounds, groups of sounds, and sound relationships in their head when planning the form of a piece. The result of the final duet improvisation can be listened to below. In the final segment, the students were shown how, after working with form in real time in this way, the computer can be a useful tool to go back and “see” the form through waveform images and “edit” it through programs like garage band and Reaper. The students left this class with their first and last homework assignment - to decide what they’d like to do for their final projects. Last week, we had our first STUDIO CLASS on the final projects. We first warmed up our ears with two minutes of quiet listening and then warmed up our voices with a simple exercise of pitch convergence on breath-length tones. The students then shared their ideas for the project. Everyone wanted to compose a piece for an instrument they played or for the group to play, and there was a lot of talk about wanting to go deeper with what they learned in the classes on harmony. We ultimately decided to work on putting together a set of materials - thinking about rhythm, harmony, and form - that we could then improvise on as individuals and/ or a group. n the picture above, you can see some of the results of this first material-making session. It was decided that there would be two main types of material - chords with a slow harmonic rhythm and interlocking patterns of intervals, especially thirds. The overarching plan was that during the interlocking pattern sections at the start and end there would be solos as well as some kind of “head” material as in a jazz form. In the center of the piece there would be the chords, and the last section of the piece would be a retrograde of sorts of the first section. This week we started in small groups working simultaneously on instrumental technique and developing the ideas that we had come up with in the last studio. After practicing some different variations on the plan, the large group came together, shared what they had made and organized it into a little piece. Next week we will be sharing this piece with the public at the final showcase - Monday June 15th - after the class, from 6 to 6:30pm at the Ironworks Gallery (406 Tompkins Street Orange, NJ). Added on May 22, 2015 by Douglas Farrand. Our middle school Creative Musicianship class has so far been an exercise in becoming more graceful teachers. This is evident first and foremost in the new structure of the 8 weeks. We decided to compress the original 8 week plan into the first 4 weeks, teaching 4 sessions on clear, streamlined topics through high-impact, fast-paced activities. The second 4 weeks we set aside for the students to work on their own projects, creating a kind of “studio class” environment that we hope will result in students taking away something concrete from the experience. We have also streamlined the language we use in the class to explain the concepts we are engaging with in order to minimize “jibber jabber” and emphasize experience. Luckily we have recruited a group of 5, multi-talented young people to come on this journey with us. The subject of the first class was SOUND and LISTENING. We went on an incredibly enjoyable sound walk around the Valley District of Orange which included such highlights as second-story wind chimes, a plethora of car noises, a rapidly flapping flag, and the final surprise of one of our student’s brothers appearing for a chat. After the walk we answered a series of offbeat questions about our topic, which were inspired by one of Pauline Oliveros’ text pieces. This led into performing her “Environmental Dialogue” which was a rowdier experience than what it had been with the high school students, but none the less memorable. One of the last sounds that echoed in the space was a tone passed from rubbing coconuts along the floor to various voices. We knew the day was a success when our very active 6th Grade “choir boy” was so excited by the experience that he brought 2 friends along the next session, telling them even as the next lesson began about how cool it was to walk and sit in silence. The second class focused on RHYTHM. We had been very excited to teach this class for months, and the experience of actually doing it didn’t let us down. The foundation of the lesson was the understanding that rhythm comes from and must be learned through our bodies. We focused primarily on different ways to use “pulse” - as it is an essential element both of getting our body to move when we listen to music and a natural phenomena in our body’s daily workings. We then went on an intense journey from complexity to simplicity and back again. First we made a beautiful polyrhythmic soundfield based on our different heart rates. Then we practiced keeping different tempi passing claps around a circle. Next they grouped these pulses by 2 and 3 and in alternations of these groups - the greatest challenge of the day. Subdivision came much more naturally and switching between quarters, eighths, triplets, sixteenths, and quintuplets became a raucous celebration. Lastly, we took Oliveros’s “Zina’s Circle” for a whirl, remembering that there our rhythms in our bodies - like that of our fastest reaction times - that we can’t perceive but that still affect us musically. The third class, with the topic of HARMONY, proved to be a difficult one to teach, and so we split it into two sessions. The first session began with a quick vocal warm-up and a launch into Oliveros’s “Slow Song,” where each participant picks a song and sings it one note/ one breath at a time. The resultant harmonies and timbres reverberating through the space was amazing. After hearing how harmony can arise from “mixtures” (as one student put it) of tones, we then practiced unisons, discovering how even from one note, harmony can arise. Through discovering the different “harmonies” of unisons sung loud, soft, smooth, rough, and on different vowels, we uncovered for ourselves the phenomenon of spectra. We then turned to the guitar and piano to introduce the students to how overtones work and practiced singing them. soprano saxophone, recorder, pocket trumpet, trumpet quartet. In the second session on HARMONY, we focused on learning to both sing and play different intervals. In our warm-up we used full breaths to sustain unisons and octaves first on the instruments and then with our voices. Afterward, we sang through all the intervals both melodically and harmonically. This proved to be quite a challenge, as we had an even split of folks comfortable and uncomfortable using their voice, but over the course of each sustain and over the course of the class, we could hear the “uncomfortable” ones starting to adjust. After learning the different intervals, the students each came up with their own chord by stacking 2 intervals or building them off a single note. You can listen to our final play-through of this below. Our next session will explore FORM - how we put together all the different parts of music into one piece, and then we will launch into the exciting experiment of studio class for kids! Added on January 19, 2015 by Douglas Farrand. Here is our first update on the ORNG Ink Creative Musicianship Class. The class is now at its half-way point and we are taking a break to observe Martin Luther King Jr. Day. The first four weeks of the class have been an excellent experience for all of us - both the two teachers and our 14 registered students. We are looking forward to the last four weeks - during which we will explore some basics of 'organic' rhythms and pitch constructions and begin to work more explicitly on group composition. We are also excited to plan the final showcase - where students will both present what they have done in the class and have the chance to share the musical work they have been doing on their own time. We also now have plans for teaching a middle school class - the same curriculum modified for that age group, as well as an adult course that approaches sound through the idea of 'space,' linking our work more directly with the "urbanism" initiatives in the area. Below you will find brief descriptions of each of our first four classes, as well as pictures and sound bites from those days. After giving our students and ourselves the opportunity to introduce themselves and share their hopes for the course, we jumped right into orienting our ears with a Pauline Oliveros score called 'Environmental Dialogue'. 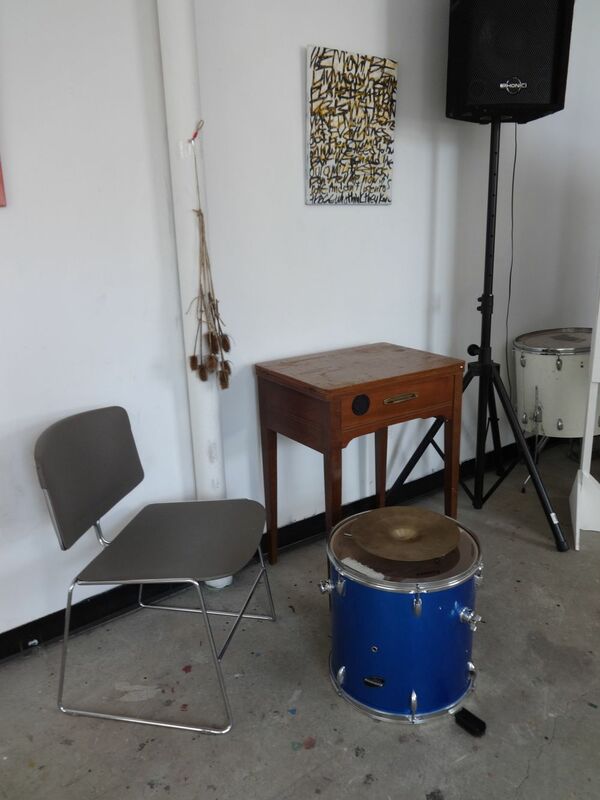 The piece broke the ice with the challenge of sitting and listening quietly to our environments, then moving at the sound of a bell into an improvisation using remembered environmental sounds. The students were enchanted by Jessie's small 'dripping' vocalizations and Doug's pinecone playing, and we were likewise impressed by both the fluidity with which the students improvised using found objects, and the bravery of their vocalizations (most memorably, one student imitated a small dog). Intrigued by this new paradigm of listening and sounding, we reflected on the difference between "listening" and "hearing" and contemplated a series of questions on the topic. To end the evening, Doug introduced the students to contact and electro-magnetic microphones, showing how the inner workings of various objects - slinkies and light switches to name a few - could be listened to with these devices. After a sound search around the space, the students left excited about making their own mics and ended the evening with their own vocalizations in the gallery's resonant acoustic. As this was a bad weather week, our session of building contact microphones was attended by three highly committed students. Doug led us all through the process of the microphone building, explaining both the physical tasks at hand and the science behind the little machines. At the end, those who came felt extremely accomplished, and all had something to take home and show for it. This was another well-attended day, including the addition of several new students. We started the day by checking-in or introducing ourselves by sharing memories of an interesting sound recently heard. The sounds ranged from short melodic contours to the sound of wind whistling through blinds. We then 'arrived in the space' together through doing some basic "body work," a combination of yogic posturing and Deep Listening exercises. We then gathered around an "amplified table," with contact microphones attached to it and routed through a mixer to speakers. There Doug led us through a series of improvising exercises (informed by Vic Rawlings' approach to teaching improvisation) - moving from exploring the different sounds of objects on the table to coordinating breath-length phrases with the group and in pairs, slowly building to playing short original pieces. The students had so many insightful things to say about this activity. These comments included their surprise at how the actions they least expected to produce interesting sounds were often the most complex, how starting and stopping the sound was a great challenge, and how the sounds - as unique as the scratching of a rusty saw - never-the-less reminded them of some of their favorite familiar sounds - like a smoky alto voice or an earthy viola tone. Below is a sound bite from one of the later improvisations. Most recently, we has another day of terrible weather and a day for our core group to shine. Instead of going ahead with the planned lesson on rhythm - which was intended for a large group - we decided to use the time as a forum for the students to share the songs they are each working on outside of class. We started by openly talking about our projects, which led us to questions like 'Why do we make music?' We discovered that for each of us the focus was different, yet we could relate to the others' motivations as well. We also talked about how making music is sometimes a struggle, even in terms of simply motivating one's self to follow through with projects. The evening ended with one student sharing an original song he had written in the fall, but shortly thereafter felt uninspired by and never saw it to competition. We then talked about how sometimes inspiration comes not from waiting, but from approaching the task at hand in a detail-oriented way. Then, from that road map, inspiration - or a pretty good approximation of it - can arise. In Class, Teaching, Funder Update Tags teaching, education, ORNG Ink. Creative Musicianship, Creative Musicianship, Update, ORNG Ink. Starting in December 2014, Jessie and I will be teaching a Creative Musicianship class out of ORNG Ink, a user-driven youth arts collective in Orange's Valley district. The class is a flexible sequence of workshops spread out over 8 weeks. Jessie and I have been fundraising to provide full scholarships to 15 teenagers in Orange, NJ to take our "Creative Musicianship" class. We've taken a lot of work at Oakwood Avenue Community School's after-school program, adapted it for older students and selected workshops and classes to fill 16 hours of class time spread out over 8 weeks. The class will provide a space for students in grades 7 through 12 to initiate a collective practice of listening and creative engagement with sound. The class is a blend of ideas and approaches borrowed from R. Murray Schafer, Pauline Oliveros, Vic Rawlings, the Walden School, various contemplative pedagogies, and the Institute for the Advancement of Philosophy for Children, alongside a selection of our own ideas and activities developed over the past year. A preliminary copy of the curriculum is available from the 'fundraising' link above.